In all sincerity, I’ve never seen Mets fans cross the line. I’ve seen them rambunctious. I’ve seen them passionate. They’re louder than most fan bases. Obnoxious? Hardly. You want an obnoxious fan base? Rickettes needs to look no further than his own. Look at how Steve Bartman has been treated by fellow Cubs fans. He was pelted with garbage. He received death threats and hate mail. They sold t-shirts with his head in a noose. The governor suggested he enter the Witness Protection Program. Famed Cubs fan and reporter, Michael Wilbon, blamed everything on him. Put Bartman aside. This is a historically awful fan base. Their own players almost went into the stands to confront their fans. It led to a infamous Lee Elia rant about how awful Cubs fans are, and how they should go out and get jobs. They heckled Kris Bryant in his first game. So next time any Cubs fan considers the Mets fans to be obnoxious, consider who he is defending. Today until 6p there is a sale on postseason merchandise in the merch tent on Mets plaza. Sale will continue all week in the Team Store. The reason? It’s because the Mets lost the World Series. It’s because typically no one wants gear from the time their team lost. Right now when I look at postseason stuff, I think more about the Mets blowing three World Series games instead of Murphtober. It’s why you don’t see Mets fans wearing 1999, 2000, or 2006 gear. It’s why the gear is on sale now. By the end of next season you will no longer see 2015 postseason gear. In the smallest of consolations, at least the World Series gear is terrible. Hopefully, it will be much better next year when the Mets win the World Series. 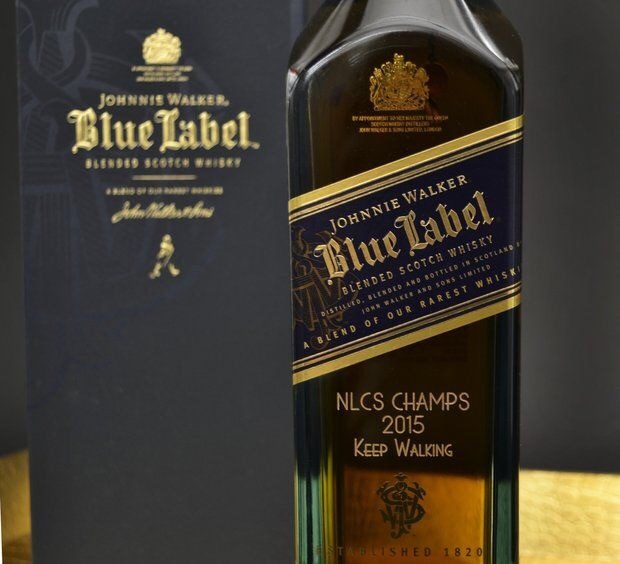 I guarantee it won’t go on sale right after the World Series ends. People will want to wear those forever. Throughout 2015, Jacob deGrom has been the Mets ace. He deserved to get the ball in the first game of the playoffs. He delivered not once, not twice, but in all three of his postseason starts. So why hand the ball to Matt Harvey now? First, it was his turn in the rotation. Players are creatures of habit. This goes doubly so for starting pitchers. There’s no need to take the pitchers out of their routine right now, especially with a long layover after sweeping the Cubs. Second, deGrom needs a little more rest. His velocity has dipped by about three MPH. He’s had less control going from 71.7% strikes to just 61.5% in the NLCS. In addition, deGrom could benefit from extra rest. During the regular season, he posted a 2.63 ERA with more than five days of rest. That’s worse than his four day rest (1.47 ERA) numbers, but it is better than his five days rest numbers (3.27 ERA). TC to Matt Harvey on Game 1: "You ready for it?" Harvey: "Damn right" And on working Game 7 in relief: "I'll be ready." We saw the advantage it was having Noah Syndergaard available in Game 5 of the NLDS. You want your best pitchers as much as possible. That should include Harvey pitching in Game 7. Note, I believe deGrom would go to the whip as well if the roles were reversed. Fourth, Harvey is pitching a little better right now. In his last start, Harvey pitched 7.2 innings allowing 4 hits, 2 earned, 2 walks, and 9 strikeouts. He was perfect through four. I’m not sure the Cubs even get a run in the game if not for a Juan Lagares misplay. In his last start deGrom pitched well. He pitched 7.0 innings allowing 4 hits, 2 earned, 1 walk, and 7 strikeouts. It’s picking nits, but deGrom wasn’t as good as Harvey. However, when you have three great starting pitchers, picking nits is all you have. Fifth, through all of it Harvey might just be the better pitcher. It doesn’t change the fact that deGrom had a better year, but Harvey has better stuff. No, I don’t have something to link here. It’s just my belief. Harvey has pitched extremely well coming off of Tommy John surgery; the year in which pitchers struggle the most. Harvey has his same repertoire of pitches and added a curveball. He has more ways to get you out. Overall, I’d go with Harvey. You can make an excellent case for deGrom as well. You can make a compelling case for Thor as well. In the end, that’s the best news. We’re arguing over three pitchers who would all arguably take the ball in Game One for the Royals. Sometimes, minor discussions like this gives you the biggest hope the Mets will win this World Series. For all we know, Harvey is Tyler Durden. If I’m right that makes Bartolo Colon Robert Paulson. It would also make Noah Syndergaard Angel Face. When Colon gets knocked out early in the game getting roughed up, I could see Thor leading the pitching staff in a “His name is Bartolo Colon” chant. This Harvey, err Durden, wants to pitch three times in the World Series. He wants to unleash his pitching repertoire causing mayhem and confusion on the Royals bench. The Royals won’t be talented or uniquely talented; they’ll all be strikeout victims. I can see the Royals saying they haven’t been struck out that way since grade school. Pretty clever, huh? Good I’ll keep it up then. He’s going to stand on the mound in Game 1 of the World Series and say, “I want you to hit me as hard as you can.” When he strikes them out, he’ll lecture them saying, “Listen to me! You have to consider the possibility that God does not like you, never wanted you, and in all probability he HATES you.” He’ll strike them out because they’re too young, too fat, too old. With the Mets playing in Kansas City to begin the World Series, they will have to choose a player to DH. There are a number of options. Late in games this postseason, the Mets have inserted Juan Lagares into the game for defensive purposes. This has moved Yoenis Cespedes to left and Michael Conforto to the bench. With a spacious Kaufman Stadium outfield, the Mets could start the game with this defensive alignment and move Conforto to DH. This becomes more of an option because Lagares is having a good postseason. It’s a way to maximize the defense while getting Conforto’s bat into the game. The Royals have all right handed starters. If past history is any indication, Terry Collins will try to get as many lefties in the lineup as possible. That would eliminate the Lagares option but keep Conforto in the lineup. The lefties on the bench now are Kelly Johnson and Kirk Nieuwenhuis. Given the choice for a first choice off the bench, Collins has consistently gone for Johnson over Nieuwenhuis. Neither has much experience against presumptive Game One starter Johnny Cueto (Johnson 1-6; Nieuwenhuis 1-3). In this circumstance, Collins would go with Johnson, who is his only backup infielder with major league experience. If something happens, Matt Reynolds will be playing his first career game in the World Series. Unlike most of the Mets roster, Michael Cuddyer has played extensively in the AL. However, despite playing 10 years in the AL, he’s only played 37 games at DH. As a DH, he has hit .265/.344/.402. This is similar to his career numbers of .277/.344/.461. At Kaufman Stadium, he’s hitting .281/.371/.531. One note of caution there is that was against some terrible Royals teams. The Mets are not facing a terrible Royals team in the World Series. Overall, he’s waited the longest of all the Mets position players to play in his first World Series. I’m sure he wants to contribute and may have a big hit in him. Sometimes that makes a dangerous player. At the end of the day, I want the best team out there. In my opinion, that is Lagares in CF and Conforto at DH. The Royals put a lot of balls in play, so the Mets will need an OF that covers a lot ground. One of the reasons The Natural is my favorite baseball movie is because it focuses on everything that makes baseball great. It showed baseball as a romantic, mythical, redemptive and magical sport. It also crushed the idea of jinxes in the sport. The Mets also showed there was no such thing as jinxes. You could argue they were tempting fate, but it really wasn’t the case. 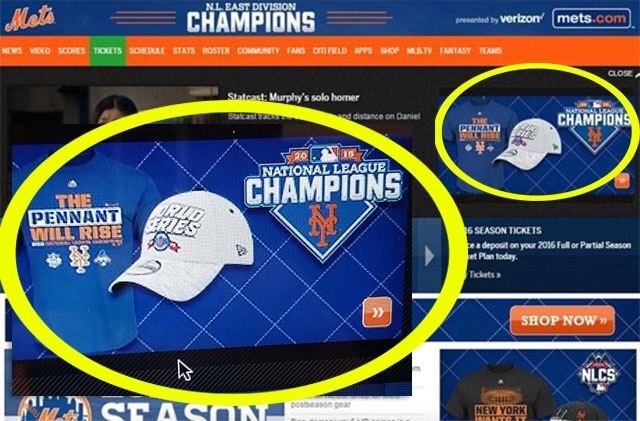 Whether it was the Mets website prematurely listing the Mets as the pennant winners . . .
. . . or Yoenis Cespedes prematurely ready to party . . . So no, I don’t believe in jinxes. Now, would anybody like to join me for some sesame chicken in Tuesday? Are the Mets Destined to Face the Blue Jays? The players are all different. The front offices and managers are different, and yet, so far, the 2015 ALCS is following a similar script. If this is omen rather than coincidence, the Blue Jays win. By and large, the NL Cy Young voting is predicted to have Zack Greinke–Clayton Kershaw–Jake Arrieta finish 1-3 in some order. Daniel Murphy has homered off of all of them. Between the Royals and the Blue Jays, there is only one Cy Young candidate: David Price. With the way Murphy has been playing this Murphtober, doesn’t it seem like he’s destined to homer off of another Cy Young caliber pitcher? Look, no matter how you slice or dice it, the R.A. Dickey trade has been enormously successful for the Mets. Two of the biggest parts of this Mets team have been Noah Syndergaard and Travis d’Arnaud. That also doesn’t include Wullmer Becerra, who is starting to become a real prospect. However, for the Blue Jays, the trade was always about winning the World Series. It doesn’t matter is he’s the fourth starter. It doesn’t matter if he hasn’t pitched well in the playoffs. It doesn’t matter if Thor is better now. All that matters now is if the Blue Jays win the World Series. 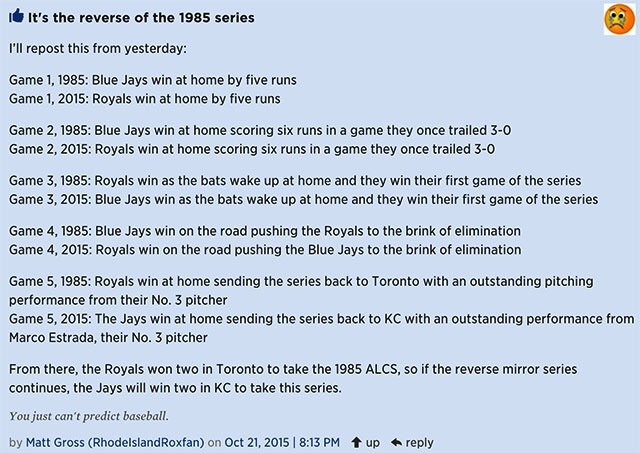 Now that I’ve wasted all that time explaining why it’ll happen, we now know the Royals will win Game 6 or 7. It doesn’t matter to me who the Mets face so long as they win the World Series. Mets pennants do not come around often. This has only been the fifth in Mets history. You know what comes around less frequently? Yes, no-hitters. Also, Mets NLCS MVPs. Can you name them? Good luck! After the euphoria of last night, I’m all pumped up. I want to watch baseball. Nope. It an off day in the ALCS. There’s now a void at 8:00. I have a suggestion. We should all watch Back to the Future, Part II. First off, any of the Back to the Future movies are terrific. My factory is the first one. It would be a desert island movie for me. I could talk about and quote that movie all day. The second one was a good movie. 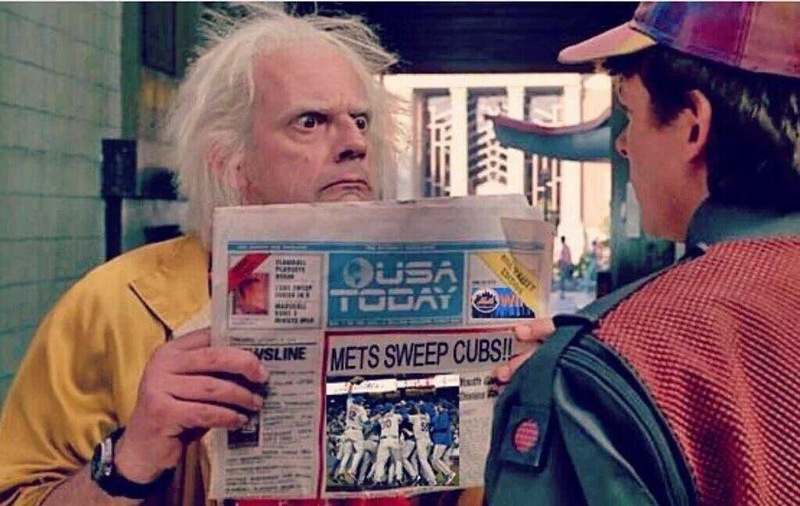 Surprisingly, the movie has now occurred in the past since Marty went to October 21, 2015. Vine provided courtesy of @lets86it. When the Mets went to the 2000 World Series, I was jumping up and down alone in my dorm room. Not many Mets fans in Western New York. When the Mets won the 2006 NLDS, I was at a bar down the road from my apartment. My brother and I ran down there after the end of the seventh inning. I remember the bar erupting, and people spraying beer all over like it was the locker room. It was awesome. Last night, I woke my 22 month old so up to see the final out. I had a much ore romantic idea of what was going to happen. We were going to cheer and high five. We would then call my Dad and brother. Instead, he watched the last out and got really, really cranky. While I was over the moon, I was trying to get a cranky kid back to bed. Once I accomplished that, I went downstairs, and I talked to my Dad and brother in hushed tones. They’re excited and talking loud. I’m talking in a loud whisper. I then went back to bed and watched all of the postgame coverage. Right after the homerun, my Dad texted me “J4 called that for Duda?” When I replied he did, his next text was, “Tell him to keep it up and speak for Wright.” I’m trying folks. This morning, my son didn’t want to get out of bed. He was tired. I wonder why? When he woke up, he said to me, “Mets HOMERUN!” It certainly was. It was the celebration I was looking forward to last night. It’s okay that I had to wait for it. Now, I just need to follow my Dad’s request and get him to predict a homerun for Wright.